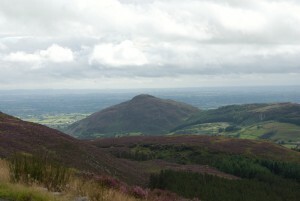 The Slieve Bloom Mountain Nature Reserve is Ireland’s largest state-owned Nature Reserve. Established in 1985 and managed to ensure the conservation of the mountain blanket bog ecosystem. The Nature Reserve is designated a Ramsar Wetland Site and a Council of Europe Biogenetic Reserve. Much of the greater upland area has been designated as a Special Area of Conservation (SAC) with the primary interest of the area is the mountain blanket bog. The Slieve Bloom Mountains are designated a Special Protection Area (SPA), of special conservation interest for the hen harrier, a rare bird of prey. The Nature Reserve is a great place for hiking, walking, bird-watching or to simply enjoy the stunning scenery. There are three way-marked walks and a viewing platform at the Ridge of Capard. There are also guided nature walks during the summer. The Slieve Bloom Nature Reserve is a great place to see plants and wildlife associated with the mountain moorland and other upland habitats. Discover more with Slieve Bloom Information leaflet here. 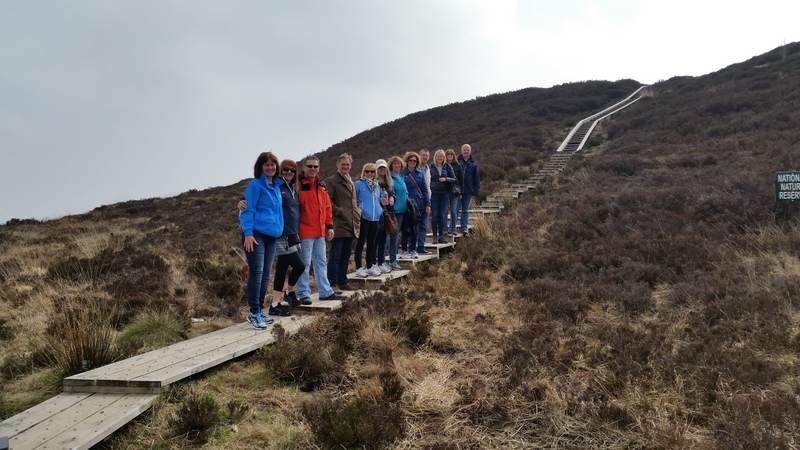 The first group from London to visit and stay at The Forum-Mountmellick starting out on the boardwalk for an enjoyable walk across the top. The walks are suited to young and old alike with the new Board Walk that covers the top of the mountain at the Ridge of Capard. Download the Slieve Bloom Walks Brochure 2018 information pack for the Slieve Bloom Nature Reserve which has information on visiting the Nature Reserve plus details on what wildlife can be found. Inside the leaflet there is a map of the Nature Reserve with information on walks with Sat Nav directions to the Boardwalk. Remember when walking in the mountains, make sure you are aware of the basic necessities and safety precautions, download the Walk Safely – DL leaflet.